Hamilton: The Musical has taken the US by storm and moved the musical theater world to new levels of interest and popularity. With sold-out shows running in three US cities, securing tickets to the show is a victory as sweet as our young nation’s victory at Yorktown! 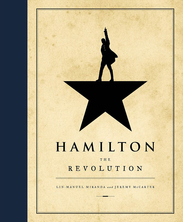 Hamilton: The Revolution, by Lin-Manuel Miranda and Jeremy McCarter captures the essence of what has made Hamilton: The Musical the cultural sensation that it has become. Old college classmates Miranda and McCarter, were, of course, involved with Hamilton from the beginning, so who best to trace the history of this cultural phenomenon. Apart from the play, the book stands in its own right as a work of art. It is stunning visually, and offers as much upon second and subsequent reads as its first perusal. The book alternates non-fiction, critical and analytical essays by McCarter with transcriptions of the show’s scene-by-scene dialogue and lyrics as written by Miranda. As an added bonus, Miranda comments on his lyrics with humorous notes that play with the reader as both theater goer and student of history. In the first few essays, McCarter comments on the original ideas for the musical, and on the initial development of artistic relationships between the play’s creator, Miranda, and many of his collaborators. He then explores bringing the production to life, the challenges of staging a modern musical, and the artistic choices that make Hamilton the ground breaking musical that it is, and the relevance of Hamilton’s ideas and themes to modern American society. Do you have a question about the musical? Well, if so, odds are one of the essays addresses your interest. Interspersed between these essays is the artistic beauty that is Hamilton. Not only do you have the full libretto (useful when singing along with the recently released Hamilton Mix-tapes), but the photography and artwork from the stage production enhance the entire artistic experience. Original dramatist notes and design sketches and outlines add to a fuller experience of what a monumental effort Hamilton is/was. If you have seen Hamilton: The Musical, then Hamilton: The Revolution is a wonderful way to relive that experience. If you’re still waiting to secure a seat to the show, then Hamilton: The Revolution will allow you to heighten your theater experience by gaining a deeper appreciation before the curtain rises (if there was a curtain!). Ria Parkar is a Bollywood star nicknamed The Ice Princess for guarding herself from the public. Ria receives a phone call from her cousin in Chicago begging Ria to come home for his wedding. After being gone for ten years, the invitation threatens to undo Ria and expose her buried secrets. Ria chose a film career, but mental illness, a fatal fire, sexual favors, and a forbidden love for her childhood friend, Vikram, cause Ria to reexamine her life. 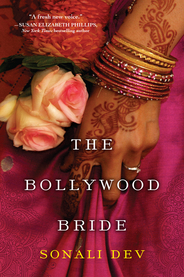 Offering a glimpse into Indian-American wedding traditions, will love and happiness prevail? 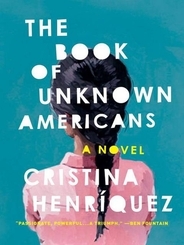 This novel shares the stories of several families, all of Latin American heritage, that share an apartment building in Delaware. Told in alternating chapters by the various characters, we learn their stories, their hopes and dreams, their backgrounds, and how they are treated by others. Their stories are intertwined and bring us into their world of discrimination and suspicion based solely on skin color. While they hail from many countries in Latin America, both as recent immigrants and as American citizens, they share the same dreams as most of us—wanting a better life for their families. Their stories are well told and will sweep you into their joys and sorrows, triumphs and tragedies. In downtown Chicago, a young woman named Esther Vaughan disappears from her apartment without a trace. A haunting letter addressed to My Dearest is found among her possessions, leaving her friend and roommate Quinn Collins to wonder where Esther is and whether or not she's the person Quinn thought she knew. Meanwhile, in a small Michigan harbor town an hour outside Chicago, a mysterious woman appears in the quiet coffee shop where eighteen-year-old Alex Gallo works as a dishwasher. He is immediately drawn to her charm and beauty, but what starts as an innocent crush quickly spirals into something far more dark and sinister than he ever expected. 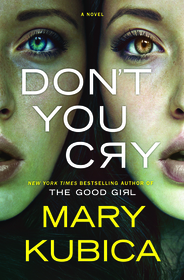 As Quinn searches for answers about Esther, and Alex is drawn further under the stranger's spell, master of suspense Mary Kubica takes readers on a taut and twisted thrill ride that builds to a stunning conclusion and shows that no matter how fast and far we run, the past always catches up with us in the end. Just when a divorced empty-nester is on the verge of trading in her Victorian Glencoe home for a classy Chicago condo and accepting a promotion she has worked years to achieve, she finds her nest replenished! 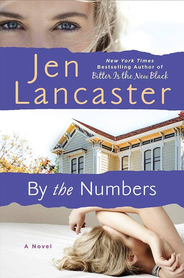 Meet Penny Sinclair, an actuary who has found living life by the numbers easier than figuring out people, yet she puts her own yearnings aside in order to host her pampered younger daughter’s expensive wedding, resulting in pricey changes to her home, her difficult parents becoming long-term house guests, and her prickly over-indulged older daughter’s critiques ringing in her ears. Oh, and she consents to letting her ex move into the den while he recuperates from an accident he suffered while vacationing with his young girlfriend! Penny made me laugh out loud; I wanted to join her and friends Patrick, Michael, and Karin for drinks and dinner. And though I sometimes shook my head at the choices she made, I understood Penny’s parental fears when she lamented, “Our parents, with their three-martini lunches, smoking while we were in utero, not making us wear seat belts or bike helmets, and telling us to go play outside and not come home until dark did a better job than we did.” It was delightful to find a protagonist who shared personality traits with younger characters like Bridget Jones and Rebecca Bloomwood, but who grew up in the USA in 60’s and 70’s like I did. An extra bonus for an Illinois reader: visualizing the Illinois towns, streets, and landmarks that intersect Penny’s account. The story of the struggles of four individuals, Kristine, Jacques, James, and Antione, who were wrongly convicted and unjustly imprisoned for decades, is a grim reminder of the disadvantage an individual has in the American justice system. The state has tremendous monetary resources at its disposal to apply to the criminal justices system. The courthouses, jails, and prisons are owned by the State. Judges, bailiffs, police offices and prosecutors are all paid by the State. In spite of all these advantages, the convictions of these four people were based on debunked junk science, false witness identification, and the testimony of an individual who was offered his own plea deal in exchange for his testimony. Perhaps the most troubling was the conviction based on a confession that was beaten out of the defendant by the Chicago police. 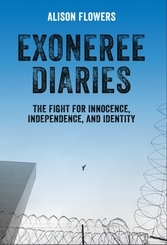 This disturbing book also examines the difficult lives these four individuals have as they attempt to reintegrate into society and is a reminder to us all of how fragile our personal freedom can be if we are on the wrong side of the criminal justice system.